In April 2017 Rob Mills photographed a distinctive insect in his garden. This turned out to be the bee-fly Anthrax anthrax, a species never confirmed from Britain before. The bee-fly was sitting on a bee hotel in his garden near Cambridge, on a log drilled with holes containing solitary bee brood cells. This bee-fly has been referred to as the Black Bee-fly, or the Anthracite Bee-fly, and its rather alarming scientific name of Anthrax derives from a Greek word for coal. 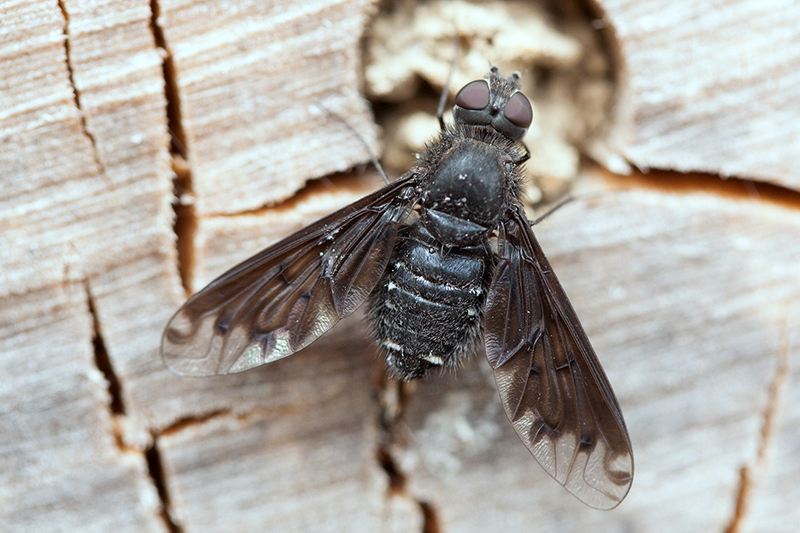 The fly’s body is black, as are its wings apart from a clear zone at the apex and around the hind margin, and it looks very different to our established bee-fly species. Unlike the common Dark-edged Bee-fly seen in gardens in the spring, it does not have a long proboscis, but it does have the characteristic delta-wing pose when at rest. The bee-fly’s larvae live in the nest cells of solitary bees, especially mason bees (Osmia) and leaf-cutter bees (Megachile), just the sort of bees which are benefitting from the popularity of bee hotels. There is still much to learn about which bee hosts are most used and the behaviour of the bee-fly. In the 1920s the Anthrax bee-fly was reputedly found in Leicestershire, but this is likely to have been the result of a mix-up in labelling of specimens taken elsewhere in Europe – Leicestershire is not the obvious place for a warmth-loving bee-fly to appear in Britain. In the last decade or so, the growing popularity of bee hotels in parts of Western Europe has enabled this bee-fly to become more frequent. Now that one Anthrax has been seen and photographed in Britain , it may yet prove to be among a growing number of insects which are establishing themselves here in response to a warmer climate, helped in this instance by the provision of suitable breeding habitat in urban gardens and elsewhere. Buglife and the Soldierflies and Allies Recording Scheme are asking people to look out for this species and would welcome news of any further sightings, with accompanying photo if possible, so that its status can be monitored. Records and photos can be added to iRecord [http://www.brc.ac.uk/irecord/] or sent to Buglife via info@buglife.org.uk. For more information see articles on the websites of the Soldierflies and Allies Recording Scheme [http://www.brc.ac.uk/soldierflies-and-allies/node/56] and Buglife [https://www.buglife.org.uk/news-%26-events/news/black-bee-fly-found-in-uk-for-first-time].